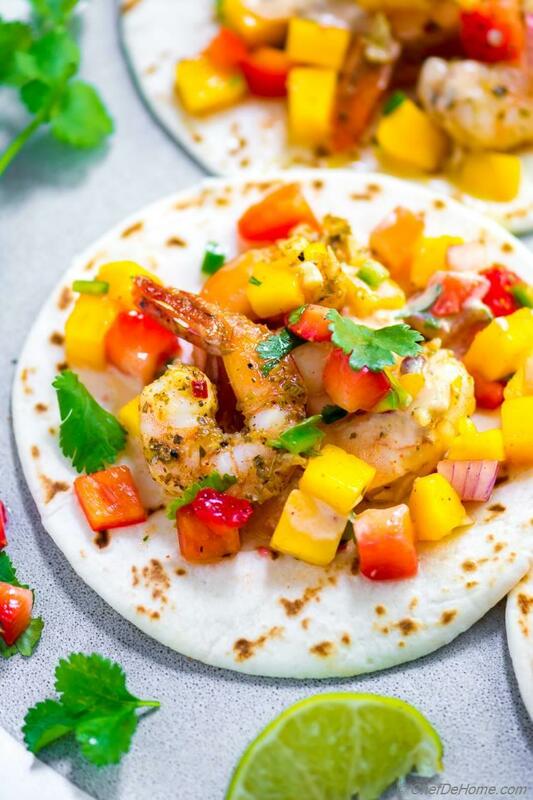 Zippy Mexican Shrimp Tacos with Mango Salsa with drizzle of Garlic-Herb pan taco sauce. Perfect for Taco Tuesday! 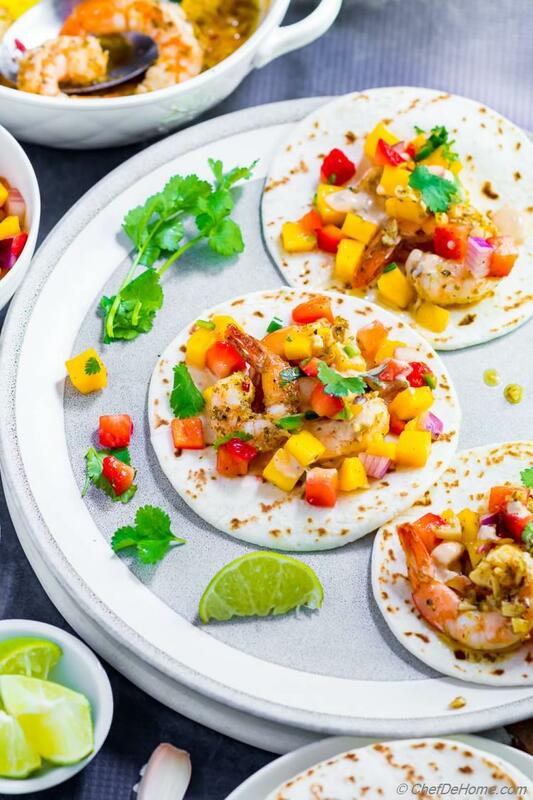 This are no ordinary Fish Tacos but garlic-citrus Shrimp Tacos with spicy mango salsa and garlicky pan taco sauce. That much and a weekday dinner promise with just 15 minutes of prep. Above all, you will love the flavors. Sit back, relax, and let's enjoy scrumptious Taco Tuesday. Easy shrimp tacos is totally my thing to serve on Tuesdays. I love the fact that shrimp cooks fast, can be ready at moment notice. It is a lean protein and rich in omegas. Healthy and above all everyone's favorite. Just say, Shrimp Tacos for Taco Night. Everyone says "yes". Isn't amazing?! If you family goes crazy for taco night. And you looking a for zesty lean break from meat tacos. Then, let's join forces and get this party started. 1. Flavorful protein: Garlic Shrimp, Chipotle Shrimp, Chimichurri Shrimp. 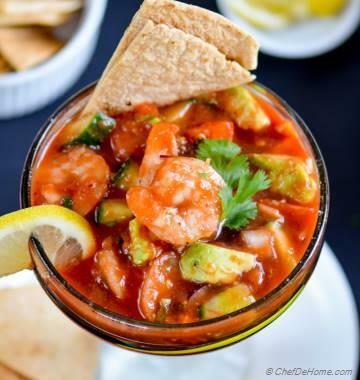 Always remember, some heat of chilies, garlic, lime and herbs will always make shrimp delicious. Only remember to cook it carefully and quickly because if overcooked shrimp can turn rubbery. 2. 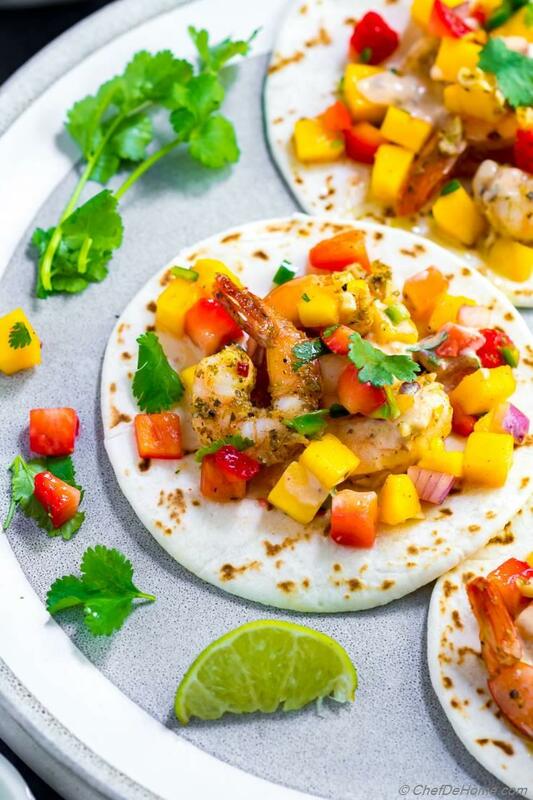 Vibrant Zesty Toppings: Salsa tops the list in shrimp tacos toppings. Mango Salsa, Salsa Verde, Chipotle Salsa or fresh Pico de gallo. A good prepared flavorful zesty salsa is all you need to set the tone for taco Tuesday. Tropical flavors of Mango Salsa specially go great with lean proteins such as shrimp, salmon or cod. Plus the color it adds to plate is irresistible. Along with salsa, there are few other ways to make Shrimp Tacos fabulous. a. Fresh or Marinated Veggies and Herbs: Sliced red onion, fresh jalapeno, cilantro. Pickled carrots, pickled radish or carrots. b. Fish Taco Sauce: This shrimp recipe make's it's own sauce. (more on this ahead). But I also used chipotle fish taco sauce on few of tacos to give you idea. Sauce recipe is quick and easy. Refer notes for recipe. Taco nights, in our family, are fun and relaxing times. I bet you can relate? Weather it is regular taco Tuesday or weekend game day or taco party.. I love recipes which let me enjoy, work less yet serve delicious tacos. So, I'm obsessed with making one-pan shrimp. Specially recipes like this which is two-in-one. To make garlic shrimp, I ready the garlic-seasoning mix a night before. When ready to serve. I pre-heat oven, coat shrimp in marinade, let it cook in oven while I warm the tortillas. 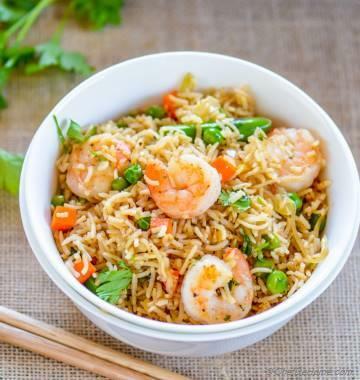 There is one more special about this marinated garlic shrimp. It has it's own sauce. Once shrimp is ready, the casserole has bubbling olive oil, garlic, spices, and citrus herb sauce which can make any meal taste fabulous. So good you will wish you can bottle a batch for later. 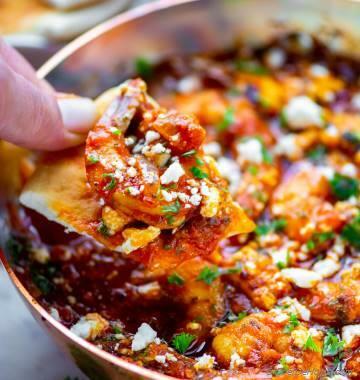 Try this method and you will have perfect cooked spicy garlic shrimp for tacos and a sauce to slather on tacos. Easy and so delicious. I highly recommend. Oh, if you just want to make after trying once? I got you covered. Check notes for recipe. Few more ideas for one-pot taco protein recipes. Add in slow cooker, come home to a pull-apart tender meat to serve over tacos. 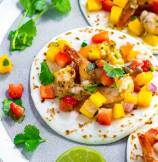 1) These tacos are bursting with flavor of garlic, citrus, and spicy mango salsa. 2) Shrimp is cooked in one pan with garlic marinade. Once shrimp is cooked, garlic marinade turns to a flavorful garlic fish tacos sauce. 3) Time saver recipe. Mango Salsa and garlic marinade can be prepared night before. 4) Look of these tacos will win you so much praise. I bet it will become regular in your menu. 2. In a oven prove dish, add shrimp, followed by all of minced garlic, lemon juice, oregano, cajon seasoning, olive oil with generous 2 pinches of salt and pinch black pepper. Toss well. Roast for 12-14 minutes or until shrimp is pink and firm. Keep an eye, don't leave shrimp in oven too long or it gets tough very quickly. 3. While shrimp cooks, make Mango Salsa (recipe from notes). 4. Once shrimp has cooked. Take it out, set aside for 2 minutes. In meantime, warm tortillas. To assemble tacos, on each taco place 2 pieces of shrimp, followed by drizzle of garlic sauce from baking dish. Top with mango salsa, and cilantro. Fresh squeeze of lime and enjoy! You can also add more fresh lime juice in garlic pan sauce for fresh flavor. Garlic Shrimp Taco Sauce: To make only sauce, save the shrimp tales and freeze. Or buy a batch of shrimp carcas (tail, shell etc.). Double or triple garlic marinade ingredients from this recipe. Add in shrimp carcas. Cook in pan (cover) or roast in oven for 15 minutes. Let cool slightly. Spoon over fish tacos, top on grilled salmon. Enjoy!